Little by little my life is getting back to normal which means I am slowly getting my craft space in order and actually creating again. A few more photos of my progress below. I was excited to create this card using my MFT Penguins in Paradise stamps and a die cut from Polynesian Paradise that I cut when I got together a couple weeks ago with my Toronto crafty girls--Natasha, Ardyth and Emily. 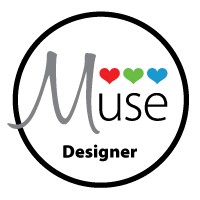 I used the MFT Wednesday Sketch Challenge Sketch for my design. At this point I am getting my stuff unpacked and in some kind of order. In the fall there will be a few changes. The ensuite will be closed off from the craft room and the door will then come in to it from the hall making it a powder room, along with that it will be renovated. There will be new paint and then a new layout of my desks. As promised I will leave you with a couple more photos, no more boxes and more floor but still messy--have a great week! Darling card, Tracey! 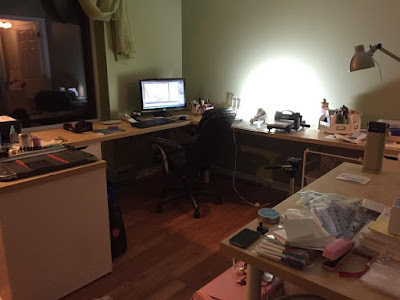 You're making great progress with your craft room! love the card! and the craft room will be great!! What a great card!! I love that you mixed the two stamp sets. Your room is coming along nicely. Glad that everything is unpacked. And your room looks a lot neater then mine and you just moved!! Such a gorgeous clean and simple design. It makes me wish summer wasn't already gone here! :) Your craft room is looking so organized and lovely and I'm sure the renovations will go well. I'm going through a move this next month and just dreading it, too! Hey Tracey! Oh my goodness the craft room is looking amazing, nice and large! You must be so tired . Not too tired to make an amazing card,this one is adorable! Your card is very clean and beautiful! I love your color and design. I'm very envy your craft room. 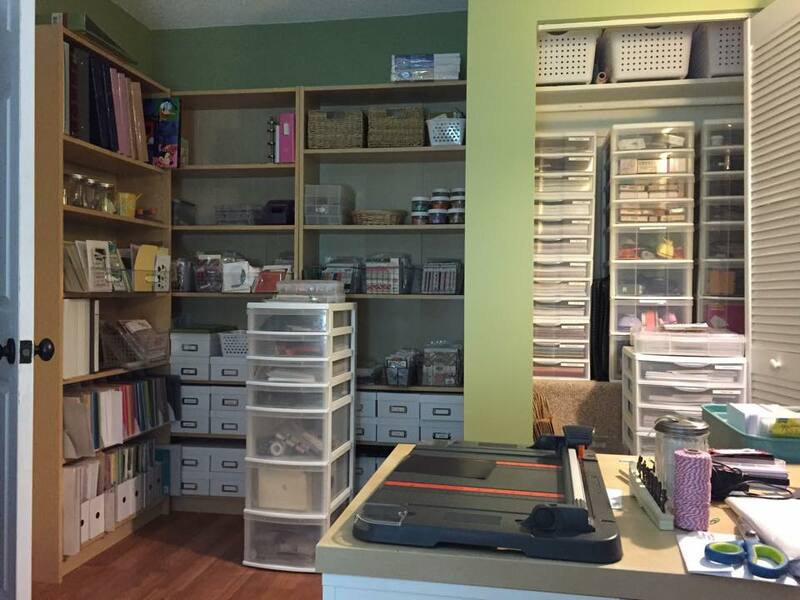 Love seeing how your craft room is coming together. It looks fabulous! Love your incredible coloring too! What a fabulous craft space, Tracey! I know you're probably sick of unpacking but it must be kind of fun to completely set up a new space. :) Loving your sweet, chilled out card and gorgeous coloring! Such a lovely card! And very fitting as I bet you want to chill after all that unpacking! Your room looks wonderful! I spent today moving part of my craft room and sorting through my son's toys to make room for a new dryer to be delivered Wednesday - then I get to put it all back! Or at least the stuff that didn't end up at the thrift store. I cannot imagine doing my whole house!!! You must be so exhausted my dear!!!! Beautiful card, look forward to giving the challenge a go. It's a beautiful room, Tracey - may you enjoy many happy hours in it! That is just adorable Tracey! Love the simplicity! It is so striking!! 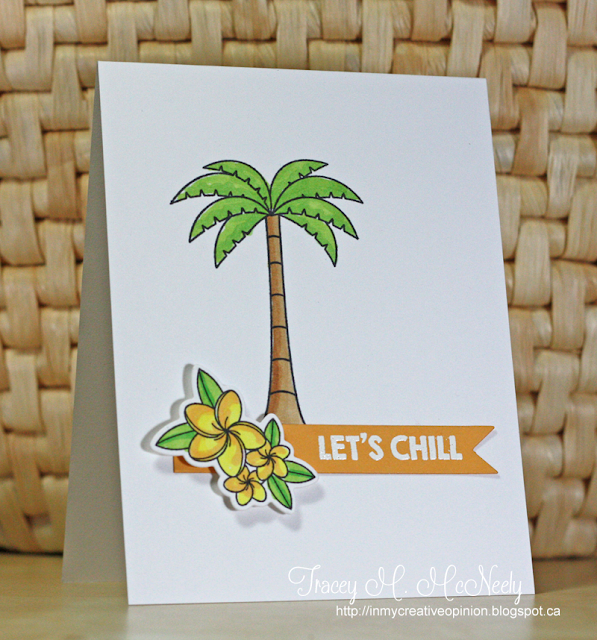 A lovely fun tropical card, Tracey! And, looks like your craft room is coming together! Lots of awesome space and very organized! Looks like you're really getting settled into your craft room...Bravo! Already looks pretty organized to me! Bet you are anxious to get everything moved in. Love your sweet card! Your coloring looks fantastic! Hello Tracey: Thank you for a delightful inspiration card, love that sweet palm tree and the flowers are colorful and beautiful. I hope my card is CAS enough for this challenge. What a super striking and deceptively simple card, Tracey! Love it! Love the card and I did play along. Oh for a craft room that big. Even in it's present state, you are a lucky girl. It's coming along nicely! How exciting! And your card is so bright and happy and full of summer fun! This is one fabulous card....would love to be sitting on a beach under a tree just like this with a nice tall diet coke! Just fabulous. On this chilly fall day, I'm ready to sit on a beach, basking in the warmth and smelling fragrant flowers...your card is charming!